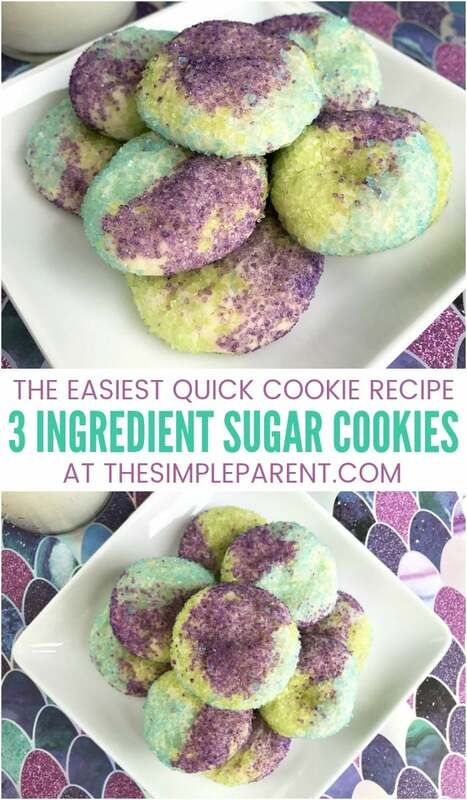 Home » recipes » 3 Ingredient Sugar Cookies You Can Make in Minutes! 3 Ingredient Sugar Cookies You Can Make in Minutes! If you’ve ever had a craving hit and just want an easy sweet treat, 3 ingredient sugar cookies are the answer! We’re huge fans of cake mix sugar cookies in our house for two reasons — they’re easy to make and you can make them quickly! Using cake mix as a base for easy sugar cookies is the key to making three ingredient cookies! See how we do it and how versatile this recipe is! I’ll admit that I have a major sweet tooth and I’ve passed it down to my daughter. So we usually have some basic baking items stocked in our pantry. But I’m not the best at baking from scratch. I’m a huge fan of things like cake mix and other mixes. So when we want to whip up an impromptu batch of cookies, our cake mix is clutch. It’s the secret behind making any kind of easy 3 ingredient cookies! So grab a box and get baking! When it comes to three ingredient cookies, the versatility comes in the type of cake mix you use for your cookies. You can use any brand though we love Duncan Hines Cake Mix Cookies around here. The brand is just a personal preference. The versatility comes in the flavor of cake mix you choose. For this easy sugar cookie recipe, we use white cake mix to keep it all really simple. The colored sugar is completely optional. Without it, you’ll have your basic 3 ingredient sugar cookies ready to go in no time at all. If you want to add a little cute factor to your cookies that’s where the colored sugar comes in. 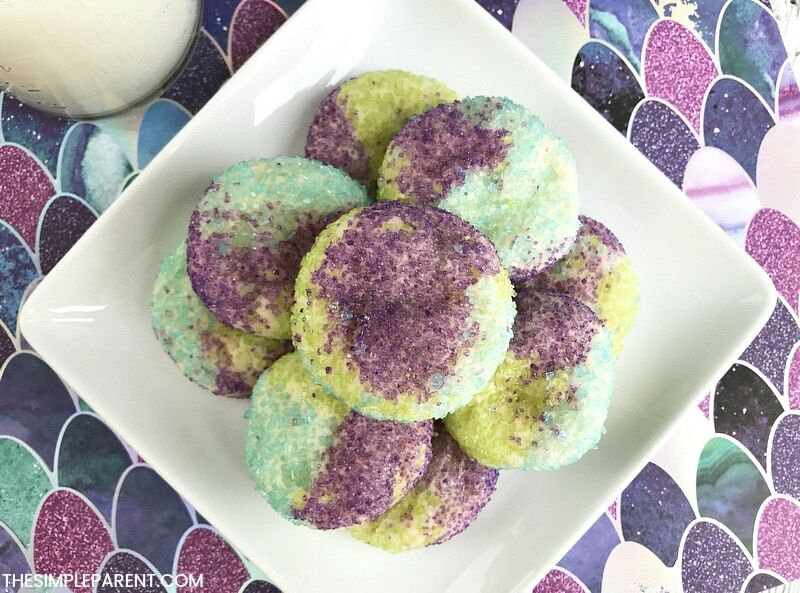 We wanted to make some “mermaid cookies” and the easiest way to make it happen was to break out the sugars! 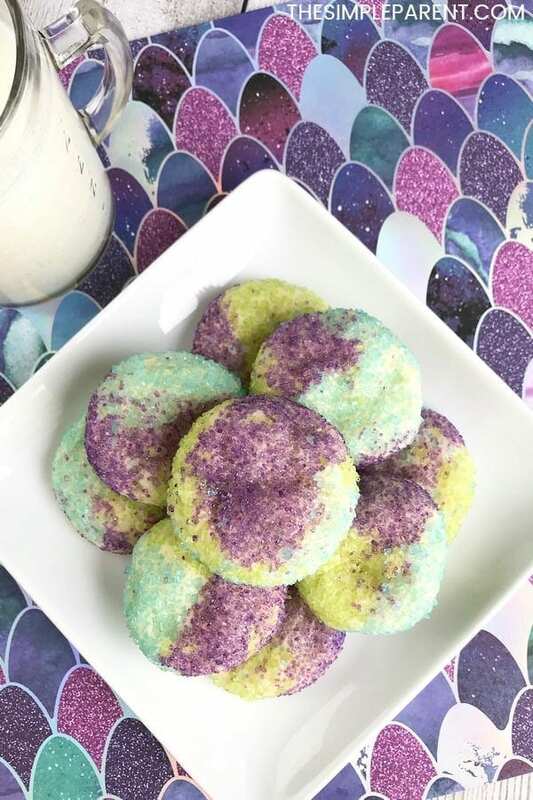 To make ours into mermaid cookies (without needing cookie cutters or fancy icing) we used blue, green, and purple colored sugar! 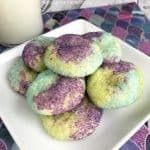 To see another way we’ve used colored sugars with cake mix cookies, check out our Unicorn Cookies Recipe! Heat the oven to 350 degrees and line a large baking sheet with parchment paper. Pour the colored sugars onto a plate, keeping them slightly separate from each other (unless you just want a rainbow sprinkles look). Combine the cake mix, eggs, and vegetable oil in a large bowl. Mix well. 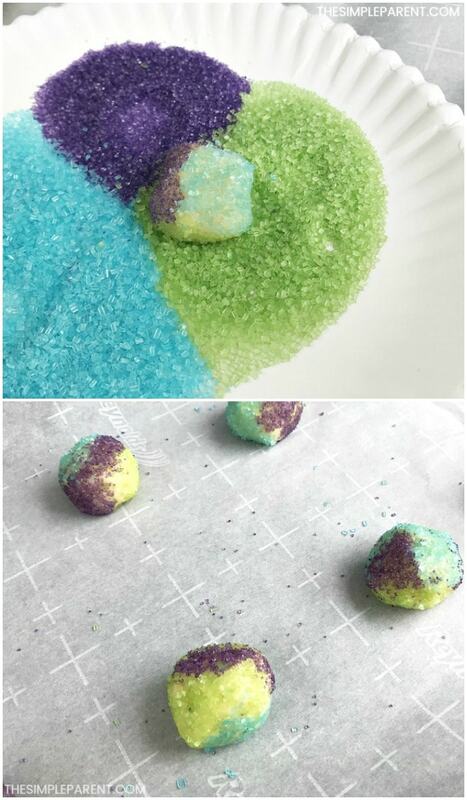 Dip the cookie balls into each sugar color, turning the cookie dough ball a bit between colors until the ball is covered. Place cookie dough balls 2″ apart on the baking pan. Bake for 8-10 minutes and remove from oven. Easy cake mix cookie recipe that makes a batch of sugar cookies in less than 20 minutes! 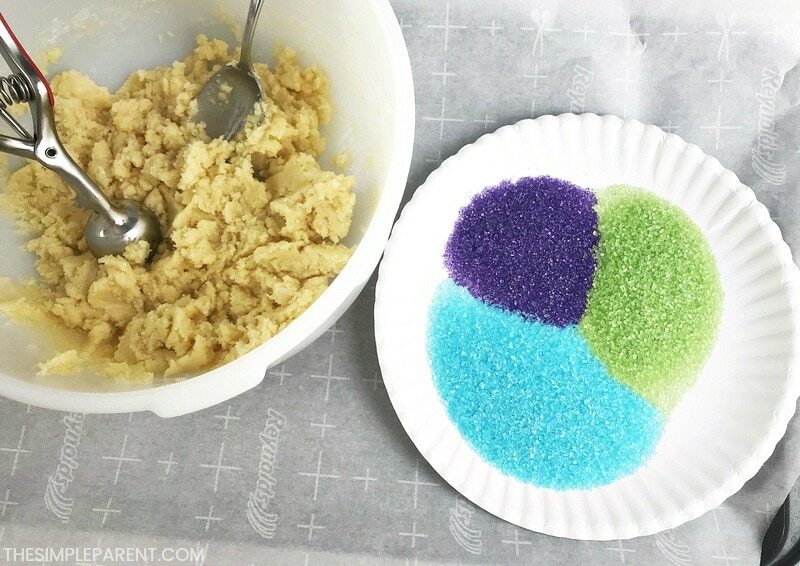 Pour the colored sugars onto a plate, keeping them slightly separate from each other. Scoop dough into 2″ balls. Bake for 8-10 minutes and remove from oven. Allow to cool completely. In less than 20 minutes we can have a batch of easy sugar cookies ready to eat! If you want a different flavor of three ingredient cookies, just swap out the cake mix flavor in this recipe. We’ve used chocolate, lemon, red velvet and more! It’s definitely one of the easiest way to get your baking on! For another pretty easy cookie recipe, try making these four ingredient strawberry white chocolate chip cookies! « Pink Fluffy Slime That You Can’t Mess Up!